Fairness is a loaded concept. 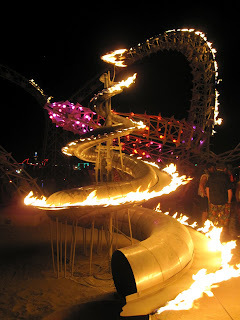 In the context of an event that is created from scratch by a committed battalion of artists, visionaries, fundraisers and participants, considering the investment of time and energy that veteran Burners have put in, often over the course of many years, to the creation of the Burning Man phenomenon is crucial. And it’s true—a lottery doesn’t care about that. For many of us, heading out to the dusty desert is going home, and leaving that to apparent chance is a weighty thing. But, changes are upon us, lottery or not. For all that Burners are often radical and open-minded, when it comes to change, they are pretty much the same as everybody else. When the event sold out for the first time in its history last year, there was a generous amount of talk about the death of the event, that 2011 would be the last year it happened, it was forever changed, etc, etc. There were a lot of people and camps that were shocked to find themselves without the tickets they needed for projects that they’d already sunk money into. The old way of waiting until the last minute to get tickets sorted was over. Ticket prices climbed and climbed as sales knocked through the tiered price scale. When the event sold out, immediately the cry went up that people didn’t have tickets they desperately needed. And this revealed, I think, that lots would have to change in the future. Among other things, budgets for essential tickets needed to be allocated, and enlarged, before thousands of dollars were spent on projects. And scalpers. For years, people have been saying how “commercialized” Burning Man has been becoming—and most of these people have never been, and really have no idea what they are talking about. Commercializing Burning Man is a tough notion, what with the near-complete absence of commerce in the place. There are no official sponsors, no advertisements. There is increasing demand from first-timers, however. A lot of these are would-be tourists, adventurous frat-boys and festival enthusiasts who want to head out to the desert on a lark. Demand is now greater than supply. There is a limit on how many people can be on-site for Burning Man each year; the calls for more tickets to be released smacks of ignorance regarding the delicate desert environment that sustains the festival. Contrast the leave-no-trace ethos of Burning Man with the filth, destruction and thousands of abandoned tents after each Glastonbury Festival—Burning Man needs to be about leaving a small footprint, otherwise the event will lose its permit. So there’s a cap on total numbers of attendees. And the question has now become: How can Burning Man tickets be distributed to the community that makes the event happen, and how can those tickets be kept out of the hands of scalpers? 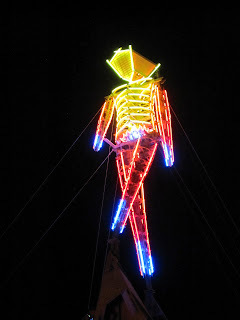 The truth is, for Burning Man, more than for any other festival, who goes really does matter. For all of the first-timers, there needs to be a weighty balance of patient veteran Burners who make sure that the virgins learn how things work; that those baby Burners are respectful of the environment, and don’t bring loads of trash to throw on burn piles. Veteran Burners know what it takes to build a camp, assemble an art installation, organize a clean-up crew and look out for each other’s safety in an extreme environment. They set the tone of the community, among all of those having their first transformative excursion. In this game of chance, the lottery has probably gone some way to keep tickets out of the hands of scalpers, who really would make Burning Man only a game for the wealthy. The first-come, first-served method doesn’t work for an event that has proved it will sell out—scalpers, whose business revolves around getting tickets faster and in greater quantities than any average attendee of the event, will win that game every time. And that would destroy the event. Truly. Because, you know what? For all that a lottery doesn’t care about your years of investment in the event, a scalper sure as hell doesn’t, and scalpers won’t care for a price many times higher than the face value of the ticket. And, the price of scalped tickets aggressively selects for a demographic that is less concerned with living light on the land; Burning Man becomes a luxury safari in this scenario. If Burning Man attendance is determined solely by the market (read: scalpers), it will be an ecological nightmare. This is to say nothing of the content of the community itself; as a friend noted, “I fear this year might end up being a lot of people in RVs waiting around all week for the event to show up.” We really need for the people that make the event to be there. So, I propose a few solutions. The first, and perhaps least palatable, is that those with extra tickets should prioritize veteran Burners over first-timers. Period. 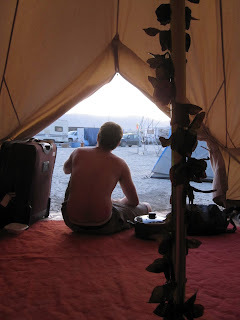 While I have lots of friends I would love to have out there with me in the Black Rock Desert, I wouldn’t want to have them out there for a big, touristey shitshow. I’ve heard people say that, in the past few years, there seems to be more and more first-timers and fewer veterans. Quite frankly, we need the veterans. We need people who prioritize the hard-won glories of building a city in the desert over the comforts of an RV. We need the crazy luminaries who throw thousands of their own dollars into constructing monumental art in which we are all immersed. These same people keep the fire burning year round, holding regional events and installing art in new homes after their desert glory. They positively change the world around them by being steadfast, and they have earned priority in this ticket scrum. Secondly, everyone needs to commit to linking the right people to the right resources. If you don’t have spare tickets, your job isn’t over. Right now, the likeliest scenario is that extra tickets are around you, as are people who need them. Keep your ear to the ground, and stay true to keeping tickets in the community. Out of tens of thousands of tickets sold this week, I have only seen about one hundred listed opportunistically on StubHub. While those few are disheartening, they are few. The rest of the allocated tickets are likely in the hands of family and friends, who are also likely faced with some tough choices about who gets to go. While this may be hard or seem unfair, it’s probably better that people with an actual interest in the event are tasked with helping get people through the gate. Thirdly, if you don’t have a ticket this week, don’t give up. Register for Burning Man’s secondary sale system (STEP), and try to get a ticket in the March sale. Don’t give into pessimism—the dust has not yet settled, and however disappointing and suspenseful this process has been, bear in mind that it’s not over. Finally, we need to reassess how we approach big projects and planning—and entitlement. Let’s not spend our time crying about chickens we counted before they hatched. Instead, let’s figure out how to get manpower to projects that need it, and let those with tickets be mightily invigorated to do something great for Black Rock City. Because if you have a ticket right now, you now have the responsibility to do something awesome and contribute. Big time. Starting now. Build something. Collaborate with projects that are underway. Think about your investment in the community. Rethink how much of your budget is about your own comfort, and reallocate resources to making this city spring up in all its fantastic glory. This event literally is only what we make it.